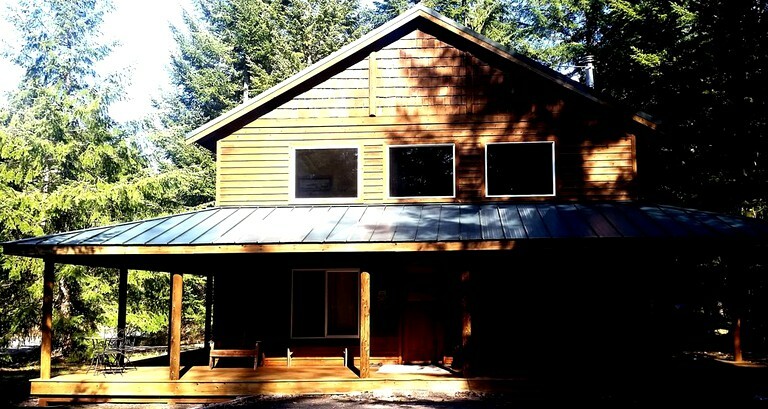 This picturesque cabin rental is nestled in the forest near Greenwater, Washington, and can accommodate up to 10 guests. 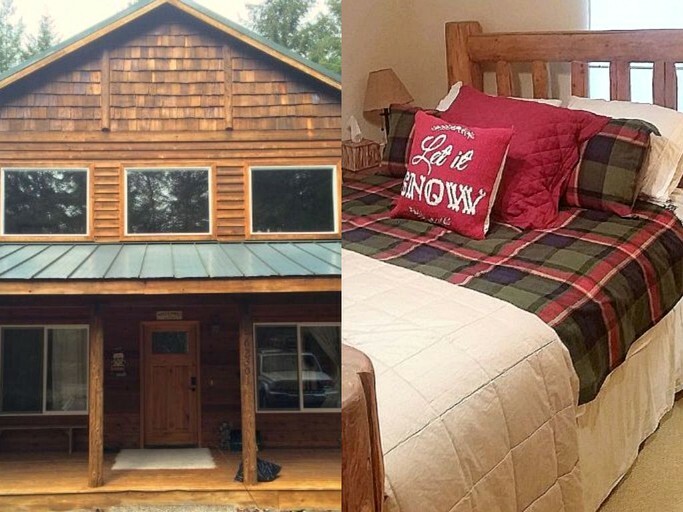 There are three bedrooms and two full bathrooms in this charming cabin. The first two bedrooms both have one queen-size bed each. 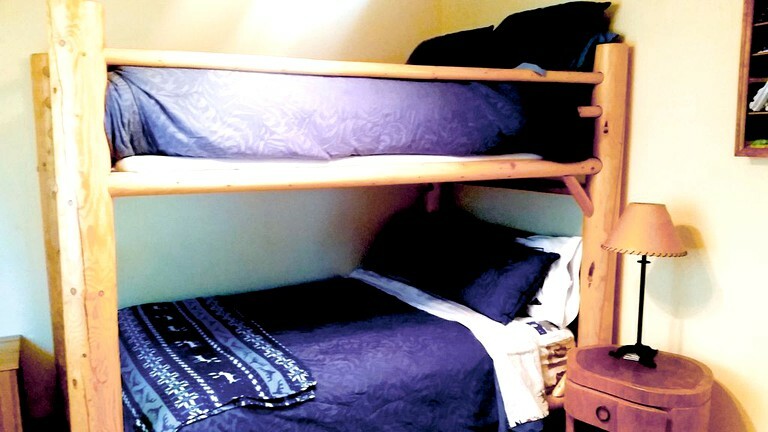 The second bedroom has two full-size beds, one set of full-size bunk beds. Guests will also have a hide-away bed in the upstairs landing area as well as an additional full-size mattress in the third bedroom's closet in case guests require extra sleeping space. The first bathroom is attached to one of the queen-size bedrooms and features a toilet, a sink, a shower, and a luxurious deep jetted bathtub. 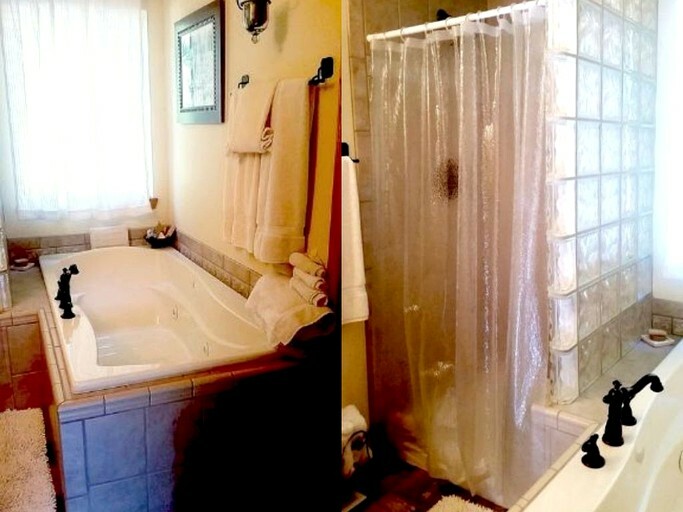 The second bedroom has a toilet, a sink, and a combination bathtub and shower. Linens and towels are kindly provided by the host. 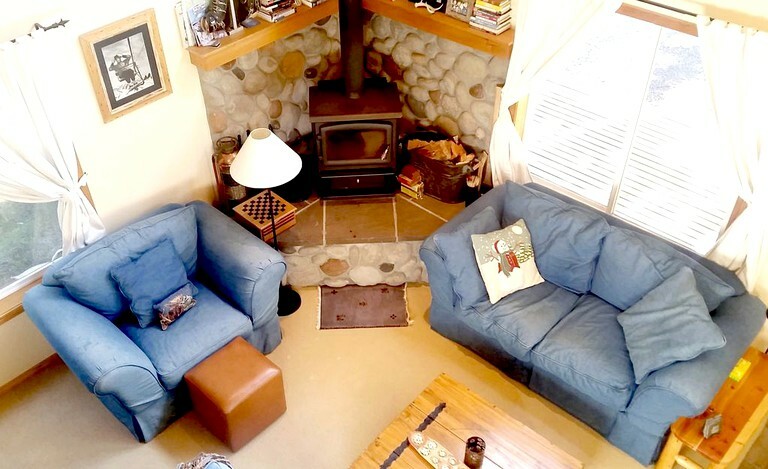 In the living room, guests will find a fluffy loveseat and two plush armchairs situated around a coffee table and beside a cozy wood stove. For indoor entertainment, guests will have a vast selection of games and DVDs, two TVs, DirecTV Cable, plenty of books, and complimentary Wi-Fi. The kitchen is equipped with an array of cooking utensils and all of the modern appliances they might need to feel at home during their stay. Guests can enjoy meals around the formal dining table with seating for eight. 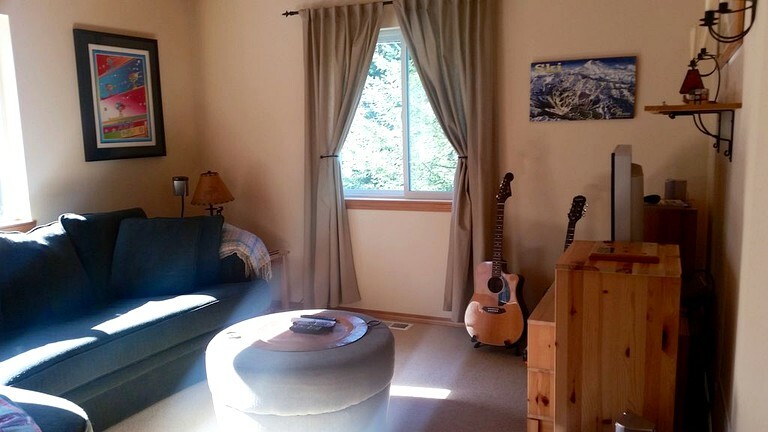 Other amenities include heating and air conditioning, a washer and dryer, free parking, an iron and ironing board, and five pairs of snowshoes for adults and children. Guests will be able to immerse themselves in the natural beauty of their wooded surroundings while still enjoying access to modern amenities and conveniences. The property features a community area with a playground, basketball and tennis courts, a baseball field, and a playfield. Guests can roast s'mores around the inviting fire pit or throw meat on the barbecue grill as they exchange stories from the day's adventures. 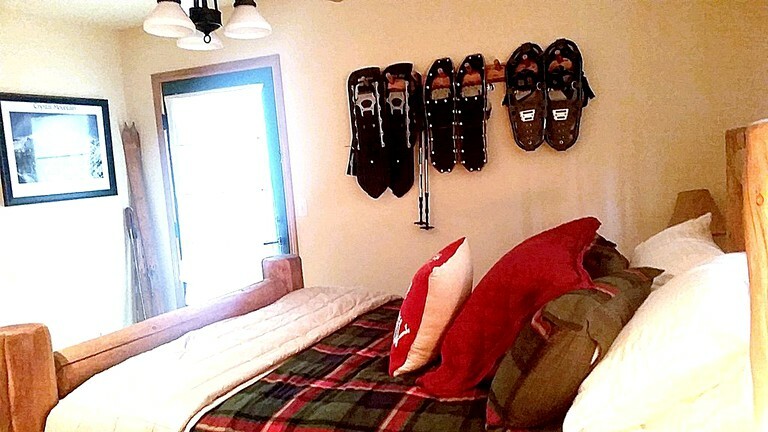 Additionally, five snowshoes are provided for guest use, three for adults and two for children. For indoor entertainment, guests will have a vast selection of games and DVDs, two TVs, DirecTV Cable, plenty of books, and complimentary Wi-Fi. 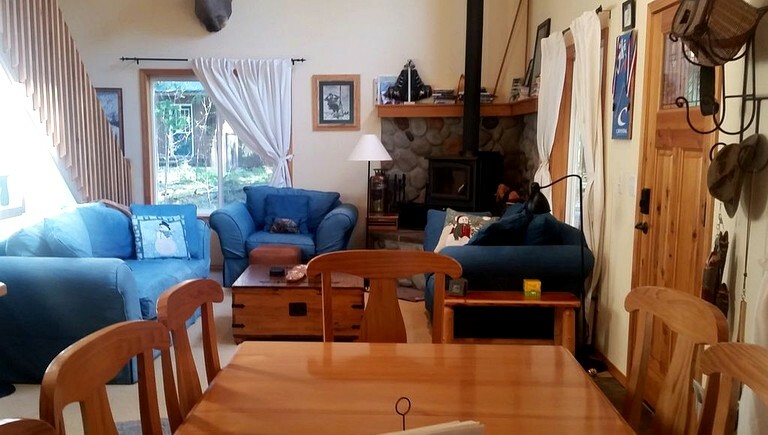 Other amenities include heating and air conditioning, a washer and dryer, free parking, an iron and ironing board, and a cozy wood stove. 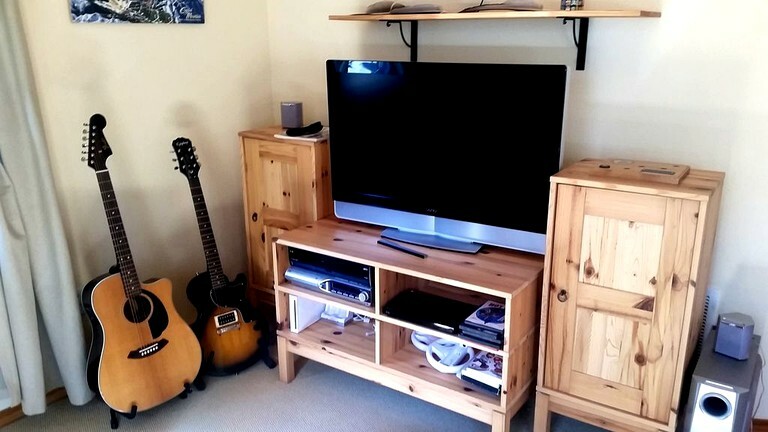 Guests will have everything they might need to feel at home during their stay at this wonderful property. 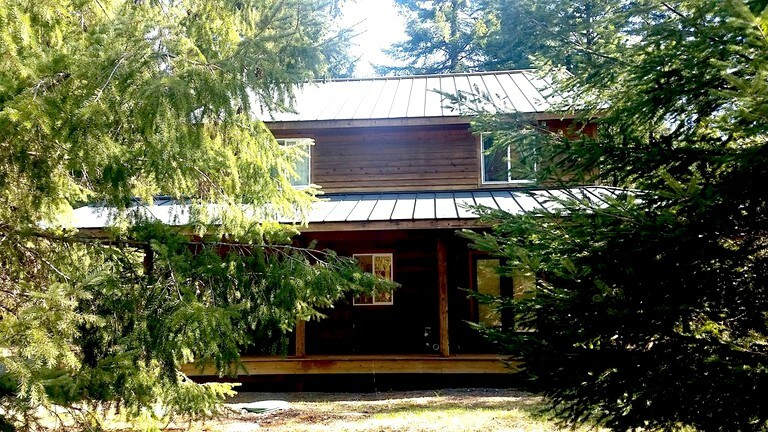 This stunning property is nestled among the majestic emerald forest landscape of Greenwater, Washington. 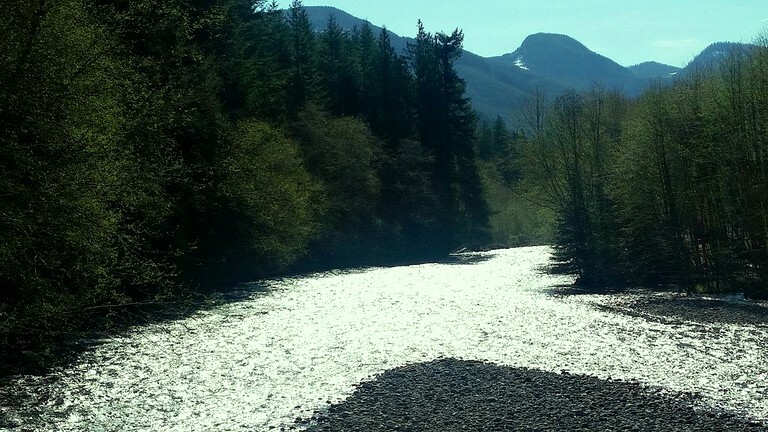 Glampers will be surrounded by natural beauty including hiking trails, rivers, and river beaches. 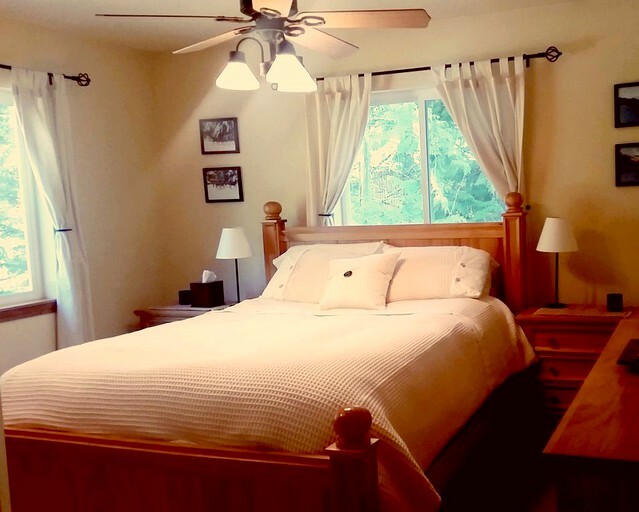 Located just a short drive from the west entrance to Mount Rainier National Park, this is the ideal spot for guests seeking outdoor recreation and adventure. 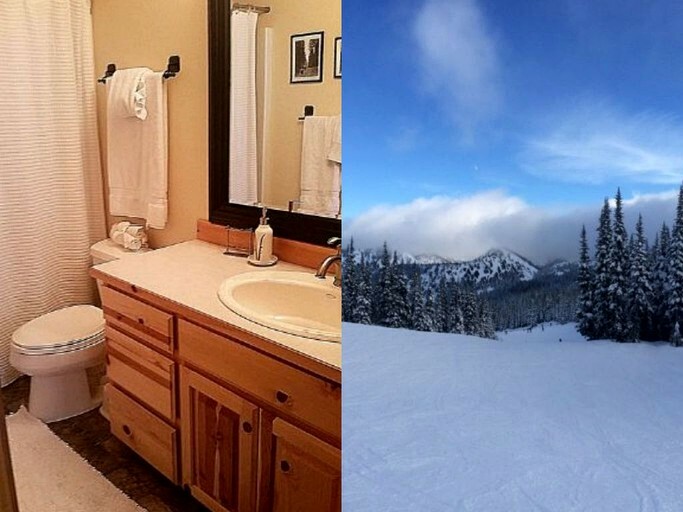 For skiing and other snow sports in winter, guests will be 25 minutes from Crystal Mountain Resort. The magnificent 268-foot waterfall Snoqualmie Falls is just over an hour away, and the sparkling waters of the White River are only a five-minute drive from the property. 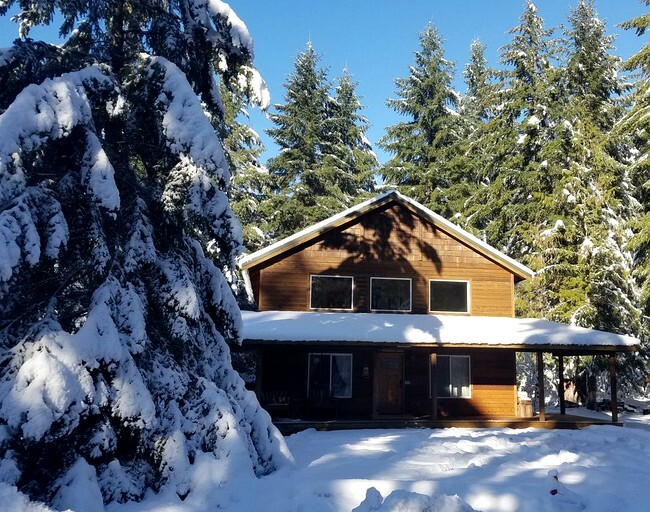 Surrounded by the magnificent natural beauty of Mount Rainier National Park, glampers will find a plethora of options for outdoor recreation and relaxation during their stay at this private retreat. In the forest, guests will find a multitude of scenic nature trails ideal for hiking, mountain biking, photography, climbing, horseback riding, and picnicking. 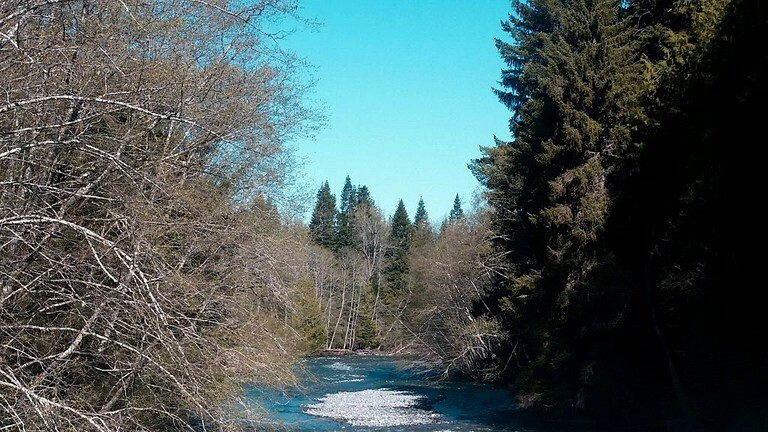 The area's plentiful lakes and rivers are fantastic for fishing, boating, kayaking, swimming, and canoeing as well. 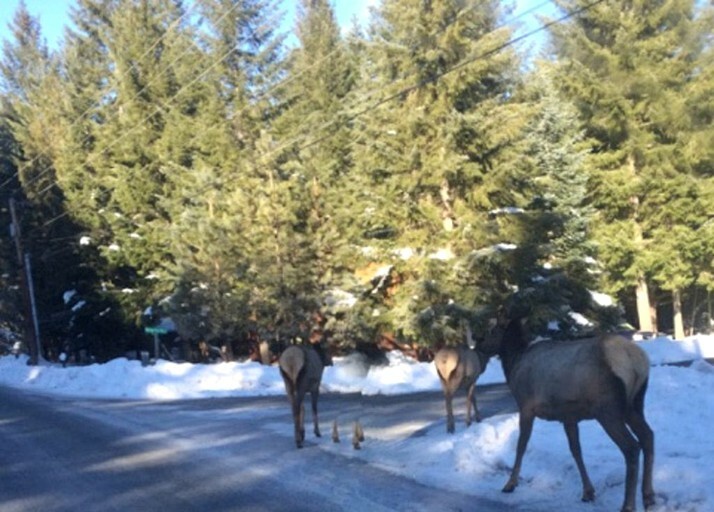 During colder months, the area is transformed into a picturesque winter wonderland and provides plenty of opportunity for snow sports and activities. 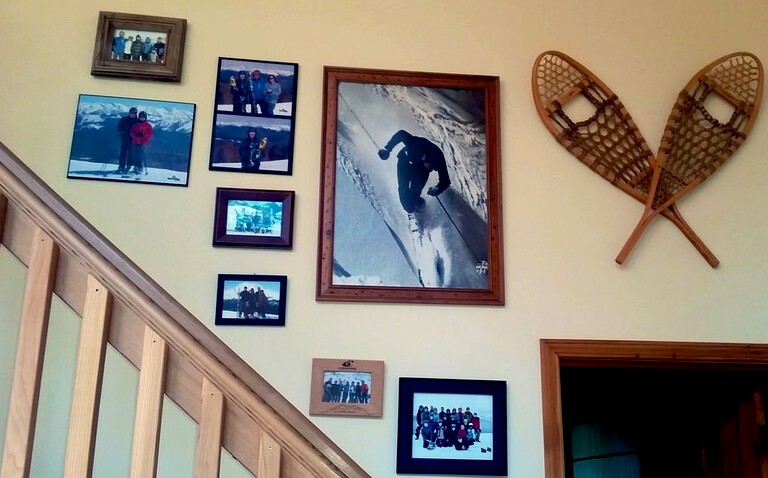 Guests will be able to enjoy downhill and cross-country skiing, snowshoeing, and snowboarding. 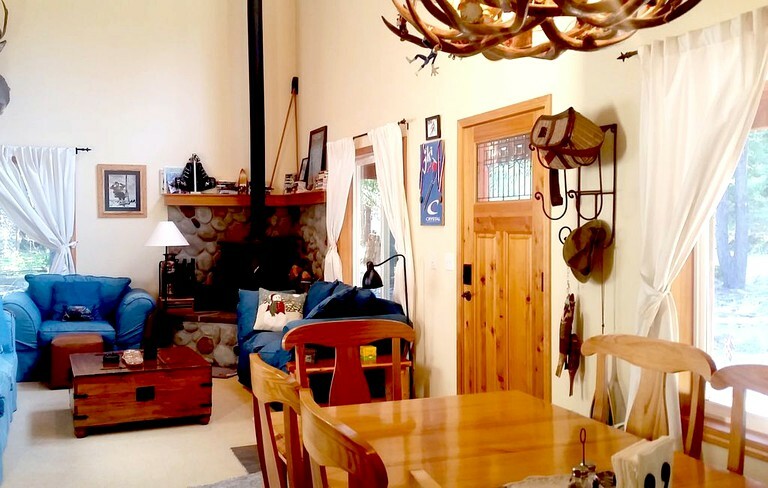 When guests are ready for a break from the great outdoors they can head to the charming community of Greenwater where they will find dining options, cafes, and unique local shops known for their hand-crafted goods. For a faster pace, guests can take a day trip to the major cities of Tacoma, Olympia, and Seattle. The maximum occupancy is 10 guests. Smoking, pets, parties, and events are not permitted. 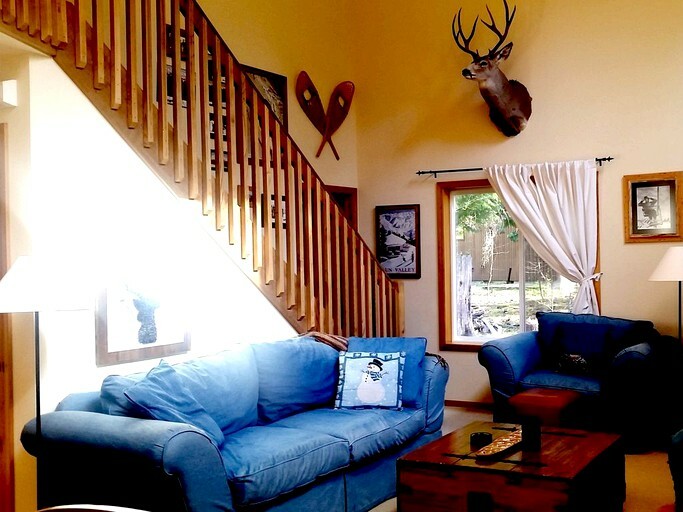 Only guests who are on the reservation are permitted on the property unless approved by the host prior to arrival. 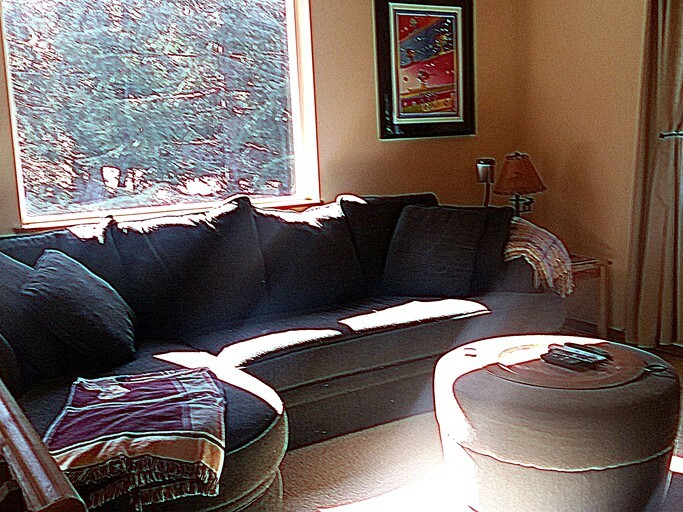 A cleaning fee and a refundable damage deposit are required.